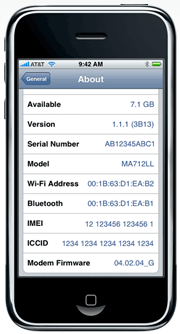 If you notice, this iPhone is up to version 1.1.1 with Modem Firmware 4.02.04_G. Apple has only publicly released iPhone Firmware 1.0.2 at this time. Apple is expected to introduce a firmware update in the near future to distribute the iTunes Wifi Store software.